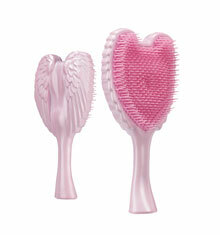 The Cherub Angel is a super-cute brush to gently detangle knotted hair, leaving hair silky smooth and easy to manage. Celebrity hairdresser Richard Ward designed the stunning and innovative design suitable for all hair types, to function superbly against knots and tangles whilst making it a great styling brush when blow drying too. 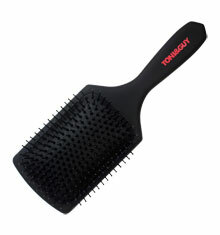 The contoured base is cleverly designed to glide through tangles and the flexible heat-resistance bristles retain their shape even when used around high temperatures. Antimicrobial additives embedded in the plastic make the Cherub Angel ultra-hygienic reducing 99.9% of bacteria growth, ideal for children’s hair! 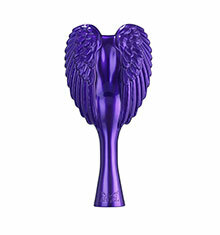 The brush can be held around the wings for greater control or with the handle for daily use, and the anti-static properties prevent flyaways, leaving hair beautifully smooth and frizz-free. 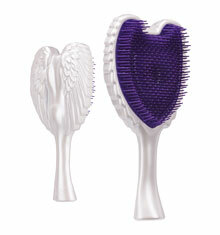 Perfect to use on wet or dry hair, the Cherub Angel is the ultimate pain free detangling brush. 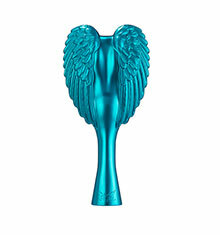 Cherub Angel is also available in baby blue and silver and its combat size at 15cm makes it ideal for carrying in a handbag.